CraftyRie: Taa daa ..... and an opinion pretty please! I wanted to make Laney a vest. I got half through the vest, changed my mind and turned it into a skirt ... when you are designing as you go, you have the liberty to change your mind! 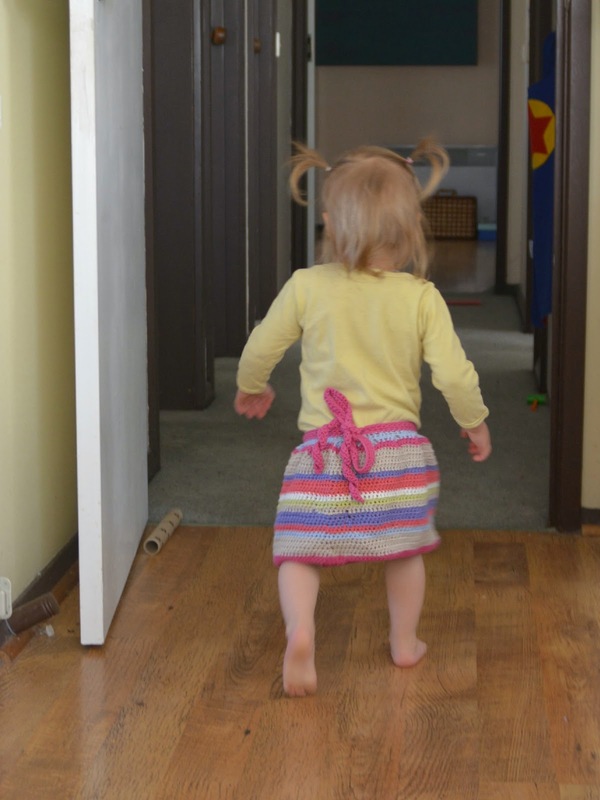 There is no elastic in the skirt and the skirt is actually made from scrap yarn (left over from this). ....but I need your opinion, you see I am thinking of turning this into a pattern and need your feedback. I need to know if it is cute as I think it is! Yep, please be honest, honesty is good. The top photo is of the front of the skirt, the photo below is of the back. There are increases in the blue rows at the top which form little pleats. It is made up of chain, single crochets & double crochets - really easy to make. This is what it looks like on an 18mth old girlie... of course, she wouldn't stand still for any photos! So, do you think others will like this skirt? I'm thinking of writing up the pattern from size 6mths, 12mths, 18mths, 24mths then maybe if that goes well then into child/youth sizes. 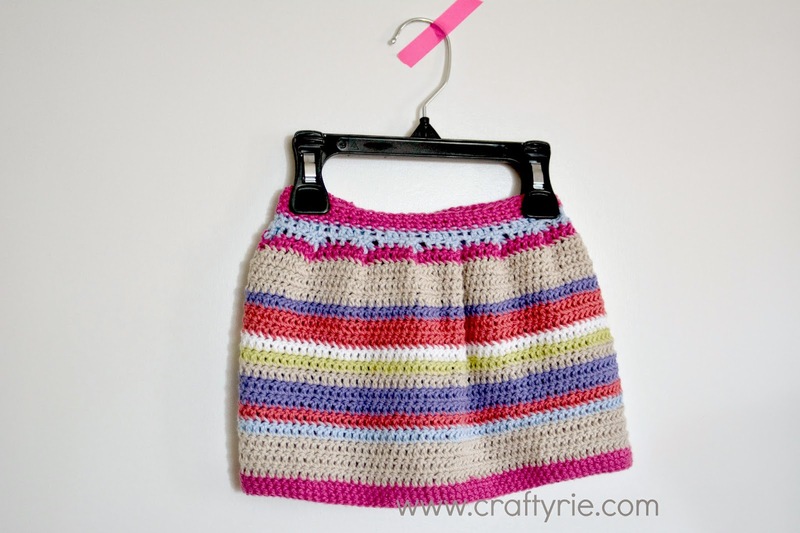 I used DK weight yarn in cotton, what is your thoughts on DK - do you have a fav weight/type of yarn for skirts? Do you think others would buy this pattern, if so how much would you expect to pay for it? All feedback will be welcome! It was such fun to make that I'm now thinking of making another in either this or this divine yarn! That is cute. What would really set it off would be a little flower out of the same threads. That's adorable, Rie. 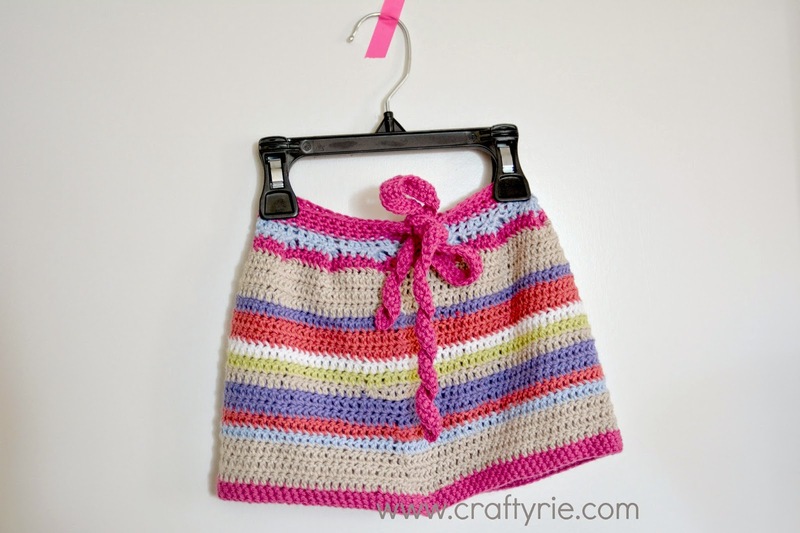 :D I'm not super into crocheted skirts (though who can say for tomorrow), but if I saw a pattern like this on ravelry, I'd expect to pay anywhere around $3-5.